Lots of road running to get through this week. Please remember to send any race reports to helsby-race-reports@outlook.com otherwise it is unlikely to get into the news! 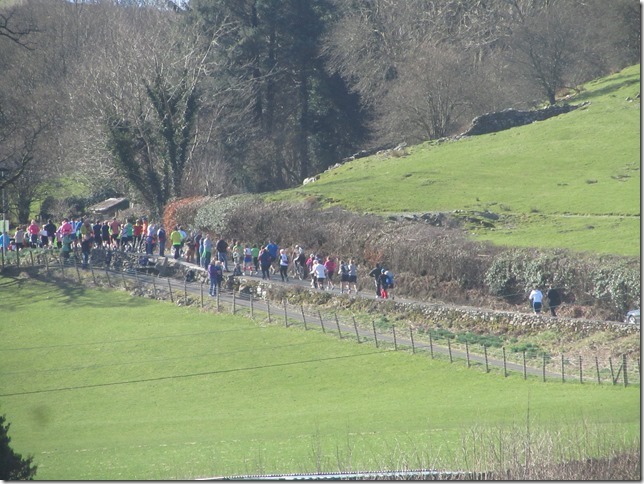 The Coniston 14 saw 3 Helsby vest out in glorious spring conditions for the annual run around Lake Coniston. Adrian 165th 1:42:49 Excellent times as its fairly undulating and we didn’t warn Adrian of the big hill at 11 miles! Lesley 475th 1:58:44 Great sub 2 hour for this course. Fantastic runs all around from what I can see! Five runners headed out for the Wilmslow half. Unfortunately I don’t have any details apart from the times. Round 5 of the Borders League saw a bright and sunny Sunday morning in Mold and an excellent turn out from the green vests. 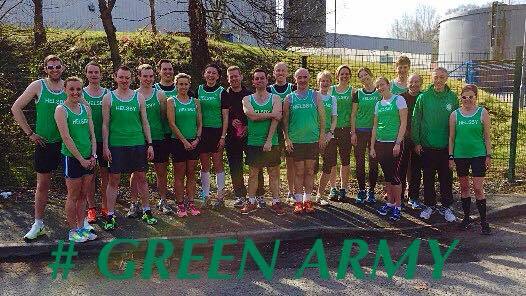 With various races on at the weekend we expected to have a slightly depleted team, but the new members turned up in droves to ensure we had a strong squad for the 5 mile undulating course and the Green Army really stole the show! Excellent running once again from Colin Bishop saw him storm around for an 11th placed run and 1st in his age category. Adam Gordon had another strong run showing his consistency in the league and Jim O’Hara, who is back from injury, didn’t disappoint with an excellent 58th. New member Neil Finegan, in his Borders League debut, had a superb race to grab 62nd place showing what great potential he has along with Darren O’Connor and Ian Rutherford who both produced some fantastic running. 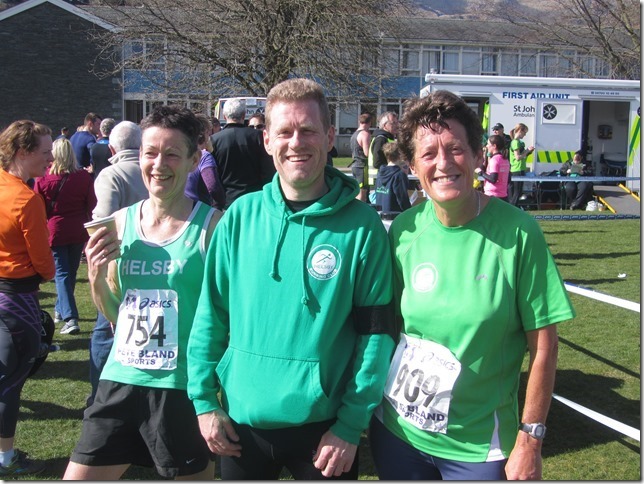 New member Chris Murray donned the green vest and found himself entangled in a close fought battle with Ade Jackson (who had ran the Coniston 14 the previous day!) and just pipped him to the finish line. Great stuff guys. Ben Williams is really starting to show some good form this year and a strong debut run from John Whitehead along with Graham Lloyd ensured the men’s team secured 2nd in Division 2 on the day. Well done chaps! The ladies team had a brilliant day, star of the show award has to go to June Swift who ran a blistering race to secure 1st back for the Helsby ladies and 1st in her age category. Well done June, I’m sure there is plenty more to come! Jo Lacking and Jane Ashbrook both ran their compression socks off to break the top 10 & 15 and Carol Shaw showed her class once again to secure 2nd in her age category. Excellent running from Vanessa and Janet Robertson saw them both inside the 40 minute mark and Sue Buck and Rhea Thomas had a close race to push each other to the finish line. Emily Smith just keeps getting quicker and had a beaming smile at the finish to show how much she enjoys the pain of Borders League racing! 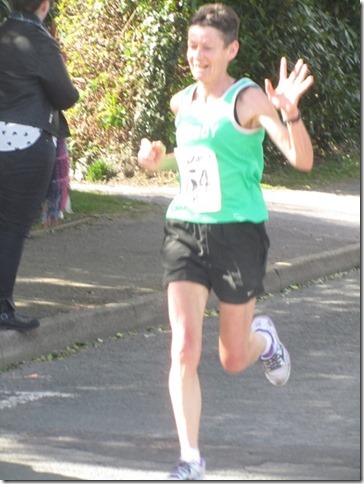 Jo Farwell and Shan McCarthy both ran well to help the ladies team top division 1 on the day. Big well done ladies! The men are currently 2nd overall in Division 2 and the ladies 4th in Division 1. The men are placed very well for promotion although unlikely to catch West Cheshire now who have had a fabulous season, however, it’s important to get a good turn out for the final 2 races in April to cement our promotion and celebrate an excellent season. Likewise for the ladies who could continue their winning ways and finish the season on a high! Nice to see the fell section are getting out so frequently – certainly inspiration to me and I can’t wait to finish the road training to finish so I can join in! Max Wainwright, Phil Roberts and myself ran the Ras Yr Aran Fell Race on Saturday and finished 17th, 79th and 80th respectively. We all agreed that this was one of the tougher 10 mile races we’d done. The route has a series of steep rocky climbs to the summit of Aran Fawddwy and returns the same way. The last of the clouds made way to glorious sunshine as we set off, and a few of us discovered we had too many layers on. Some fantastic views of Bala and the surrounding area if you were confident enough to take your eyes of where you was putting your feet. 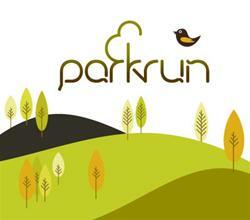 Park run is still proving popular with the Green army – quite rightly so! Look after the 5 & 10 Ks and the rest looks after itself! No counters this week, but There are some races in the NCC (Non-Club Counters) calendars. These calendars are there for you to add to. If you see a race you fancy or think others might then add it into the calendar, they are all open. It’s easiest to use google calendar to update these, but you can do so from any other web connected application; e.g., outlook. I’ll try to pull together a user guide for the most common ones. In the mean time there is the Liverpool half this weekend as well as two fell races: Caused Pike on Saturday and Lad’s leap on the Sunday – both are in the NCC – Fell calendar.